Sen. Kirsten Gillibrand, D-N.Y., is helping build a national network of donor groups supporting federal and state office-seekers. WASHINGTON — It's one of the defining stories of the midterms: An explosion of Democratic women running for office in record numbers and outperforming male rivals in primaries, potentially reshaping the party for years to come. Behind the scenes, Democratic women are looking to fuel the trend by expanding their reach within another historically male-dominated field: Political fundraising. Over several cycles, donors have helped lay the groundwork for a national network of women's "giving circles," informal organizations in which mostly upscale members pledge a minimum amount of cash toward candidates for an election cycle. The model is adapted from the philanthropy world, where similar groups pool together charitable donations. The circles, many of which have an explicit focus on gender representation in Congress and statehouses, have become a fundraising stop for Democratic politicians like Sen. Tina Smith in Minnesota and gubernatorial candidate Stacey Abrams in Georgia, complementing more established organizations like EMILY's List, which backs women who support abortion rights. "When people ask me, 'How do I get involved?' I say create a giving circle," Sen. Kirsten Gillibrand, D-N.Y., told NBC News in an interview. Gillibrand, who is often mentioned as a potential 2020 presidential candidate, has spent the last four years recruiting donors and attending fundraisers with the Electing Women Alliance, an umbrella network with 17 groups around the country focused on Senate and governor races. The New York lawmaker said she was inspired to promote giving circles after attending a fundraiser as a congressional candidate in Denver, where the EWA's flagship group, Electing Women PAC, began in 2000. 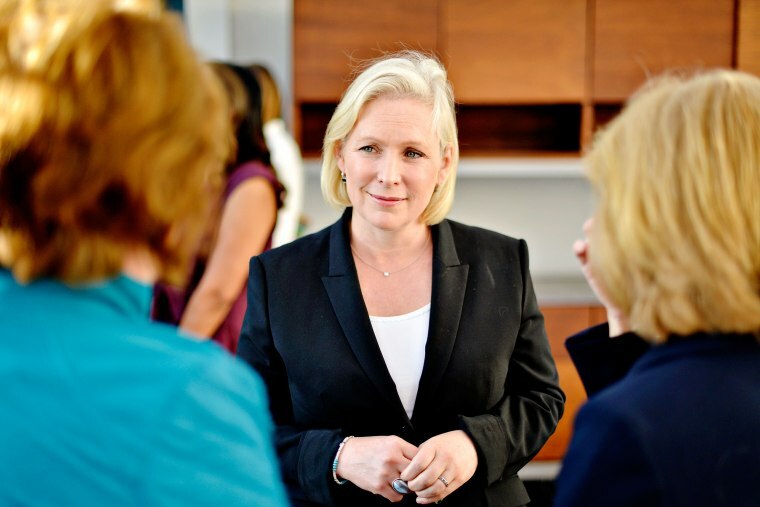 "Instead of men just having law firm events and business events and women doing all the work and not getting to ask the questions, it's a better model to have fundraising be more community focused,” Gillibrand said. "Given that we are still in a money-in-politics system, I'd like more women to have a seat at that table." Organizers with EWA say their network has raised $5 million this cycle across all giving circles, an increase from about $1.5 million in 2016 when they had just six groups. Their growth has coincided in a huge national rise in both women candidates and women donors on the Democratic side, as well as a surge in activism in response to President Donald Trump's agenda, headlined by the Women's March last year. As of July 23, 329,000 women had donated at least $200 to a federal campaign or PAC in the 2018 cycle, according to the Center for Responsive Politics, far outpacing the 198,000 women who donated similar amounts over the entire 2014 midterms. Men still make up close to two-thirds of donors, with women's share up slightly from 2014, but women's contributions are becoming more concentrated on one side: 61 percent of donations to candidates or parties have gone to Democrats this cycle. In the last midterms, a 51 percent majority went to Republicans. The data suggests these Democratic women are more eager to support women with their dollars as well. As of March, 44 percent of contributions to Democratic women running for Congress came from women, according to the Center for Responsive Politics, the highest share yet and a five-point jump from 2014. By comparison, they made up 34 percent of contributions to male Democratic House candidates, which also was a new high. Naomi Aberly, a longtime Democratic fundraiser, told NBC News she founded a giving circle after growing accustomed to being one of few women at high-dollar events where prominent candidates mingled with donors. Aberly's money bought her a seat at the table, but she found it was harder to put issues like reproductive rights on the agenda while men bent politicians' ears with their own favored causes. She reached out to her contacts about forming a donor group in Boston that would collect pledges from members and host events with federal candidates who fit their issue profile. "We invited as many women as we knew who were already engaged in politics, but we also invited women we knew were working deeply on issues like education, the environment, reproductive rights, gun violence, criminal justice reform, you name it," she said. "There are women who are doing amazing work in the charitable space, but not often the political space." Their first meeting in 2015 attracted about 50 participants and members who used their clout to help fund female Senate candidates, including Sens. Catherine Cortez Masto, D-Nev., and Maggie Hassan, D-N.H. Since then, they've grown to 140 members and expect to donate $1.5 million to candidates by the end of the midterm cycle. Heather Lurie, director of the original Denver Electing Women PAC, told NBC News the group's membership has nearly doubled since 2016 and they're hosting 12 candidates for Senate and governor this cycle. Members are predominantly lawyers, businesswomen and other professionals who agree to pledge a minimum of $4,000 a year, $1,000 of which goes to handling overhead costs. The goal is to guarantee at least $25,000 in donations to any candidate who comes to address the group and Lurie takes pride in never having come up short. "One thing we’ve definitely learned over the years is that there's power in individual women writing checks, but the real power is in raising the money," Lurie said. "A group that can raise $25,000 or $50,000 or $75,000, that's more than enough for people to take notice." The group, formed in the aftermath of Gail Schoettler's unsuccessful run for governor in 1998, makes a point of playing in competitive primaries as well as general elections. This week, it's holding a fundraiser for Gwen Graham, the only woman running for governor in Florida and who is facing four male candidates in next month's primary. Outside the EWA, similar groups are popping up to recruit and promote women candidates at the state level. Valerie McGinty, founder of California-based Fund Her, says her organization has attracted about 1,000 members since launching last year and raised over $225,000 for 11 candidates in state legislature races. Only one-quarter of the state's legislators are women. "We are laser focused on the state legislature with a goal of reaching gender parity by 2028," McGinty said. So far nine of their candidates have made it to the general election. In two races, they supported women vying to replace male legislators who had resigned over accusations of sexual misconduct; one of the women, Luz Rivas, advanced to a runoff. Donors say they're hoping their groups can lend momentum to an unprecedented wave of Democratic women running for office this year. In the House, 476 women have filed to run, according to the Center for American Women and Politics at Rutgers University, easily breaking the 2012 record of 298 women, and 356 of the candidates are Democrats. In the Senate, a record 54 women are running, including 11 incumbent Democrats up for re-election, many of whom face top tier challenges from Republicans. Women have been winning, too: In 107 Democratic House primaries featuring at least one man, one woman, and no incumbent, a woman has advanced in 70, according to an NBC News analysis. "We are seeing an enormous growth in interest, in part because there's so many women candidates out there that it's hard for us to even support them all," said Stacy Mason, who serves as executive director of Electing Women Bay Area. Organizers say groups focused on electing women make an impact by providing a ready-made fundraising circuit for first-time candidates. "They're changing outcomes for House and Senate candidates," Gillibrand said. "For a candidate who doesn't have a national network, it's absolutely invaluable." The rise of organized women donors could spill over beyond 2018, as a number of high-profile Democratic lawmakers, including Gillibrand, are considered likely presidential contenders. Having an established relationship with a fundraising network over several cycles could help provide seed money in a crowded primary fight, though Gillibrand said she expects the groups to host male presidential hopefuls as well. "It's great because it's going to be in existence for a very long time," Gillibrand said when asked about the potential impact of giving circles on the 2020 race. "It's not just '18 or '20, but '22 and '24 and '26. It's meant to be a way for women to be involved in all elections." CORRECTION (July 30, 11:01 a.m.): An earlier version of this article misstated the name of the Denver-based political action committee dedicated to supporting women running for office. It is Electing Women PAC, not Election Women PAC.